UK air traffic service provider NATS has signed a Memorandum of Understanding with Airbus ProSky, with the aim of providing new market propositions that can increase capacity and improve the efficiency of the air traffic system. 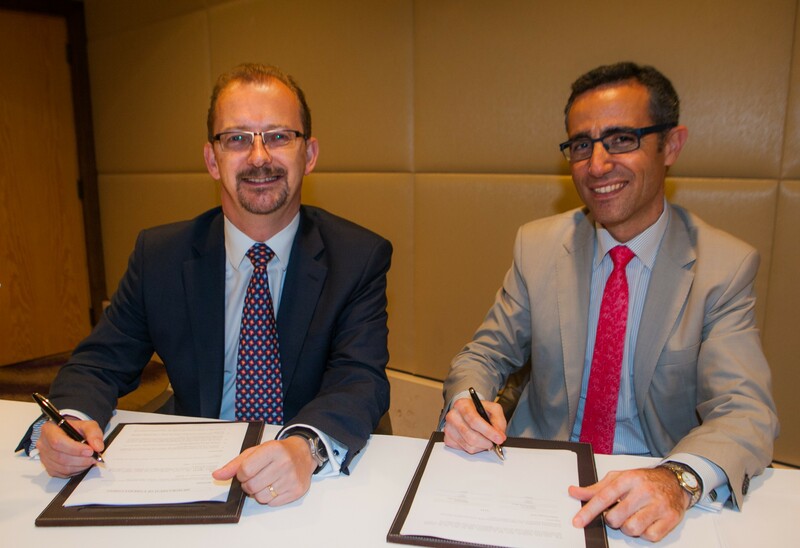 NATS Chief Executive Officer, Richard Deakin signed the agreement with Paul-Franck Bijou, Airbus ProSky CEO, at the Airbus ProSky yearly Symposium held in Abu Dhabi this week. The two companies will work together, combining NATS’ operational expertise in air traffic management with Airbus ProSky’s innovative solutions and deep knowledge of airborne capabilities, to develop joint propositions to address industry challenges. Finding ways to improve airport resilience in adverse weather, including in low visibility, thunderstorms and high headwinds, is expected to be an early priority for collaboration as it represents an area where the joint expertise of both partners can be harnessed. Other cooperation areas include air traffic flow management and airspace design. Richard Deakin and Mr Bijou sign the Memorandum of Understanding. NATS already plans to introduce Time Based Separation at Heathrow Airport next year in a move that will halve delays due to high headwinds. Together with Airbus ProSky it now intends to target ways to improve capacity during low visibility. That work is expected to centre on enhancements to airport technology and low visibility procedures, delivering solutions that can benefit airlines and airports around the world.